Charity Angel Dawson, Desi Oakley, and Lenne Klingaman in the National Tour of Waitress: The Musical. Photo by Joan Marcus. The Broadway tour of Waitress: The Musical opened for business at the Orpheum Theatre Tuesday night, complete with the intoxicating aroma of hot pie filling the lobby during intermission. The evening was alternately sweet, hearty, and tart, in keeping with the show’s material. This is the show that inspires a thousand cooking puns. 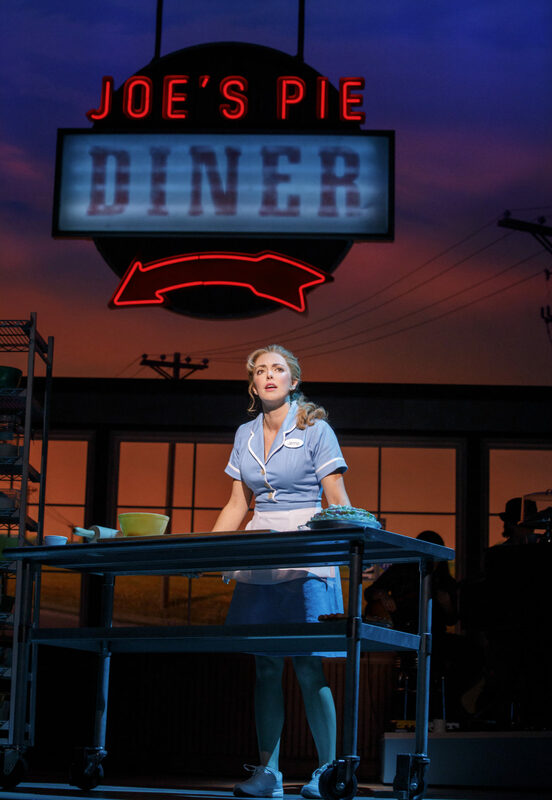 To say that Waitress is revolutionary would be an exaggeration; the characters and situations do not have that “never seen on stage” ring to them. Rather, it’s the small details that make the difference – how these characters are rounded out and how little moments develop. At the end of the evening, one has a sense that hundreds of small decisions have added up to something fresh and intoxicating. Like the refrain “Sugar…butter…”, it’s amazing what a few changes in proportion can do. Bryan Fenkart’s doctor (right) courts Desi Oakley’s baker. Sort of. In a kitchen. Photo by Joan Marcus. In a neat piece of math, Waitress: The Musical comes to Minneapolis a decade after the 2007 indy film of the same name starring Keri Russell. The narrative is more or less the same: a small-town waitress trapped in a loveless marriage dreams of baking her way to a new life, while dealing with the news of an unplanned pregnancy. The excellent film script by Adrienne Shelly is elegantly adapted for the stage table by Jessie Nelson, and deliciously paired with a vibrant score of musical entrées by Sara Bareilles. While Waitress is Bareilles’ first full-length musical, it has none of the telltales of juvenalia: it’s a great score, finely tuned to the action and spiced with memorable songs like “Focus on the Negative”, “When He Sees Me”, “Never Getting Rid of Me”, and “She Used to Be Mine”. Lorin Latarro’s choreography is smooth and fun, but not showy – much like the character-driven story. There are no kingdoms to save or national soundscapes to rewrite, just the lives of characters like Jenna (Desi Oakley) that you come to care strongly about over the course of the evening. Desi Oakley as Jenna in the National Tour of Waitress. Photo by Joan Marcus. With a small handful of exceptions, the women of Waitress take center stage in the narrative and the soundtrack. Desi Oakley’s Jenna has a little more anger in her portrayal than Jessie Mueller’s Broadway portrayal, but she sells it well as an interesting and valid interpretation. Oakley’s scenes and duets with Bryan Fenkart’s Dr. Pomatter, including numbers like “It Only Takes a Taste” and “Bad Idea”, are some of the show highlights. Lenne Klingaman (as Dawn) and Charity Angel Dawson (as Becky) give strong supporting performances that make you look forward to each time they speak or sing. 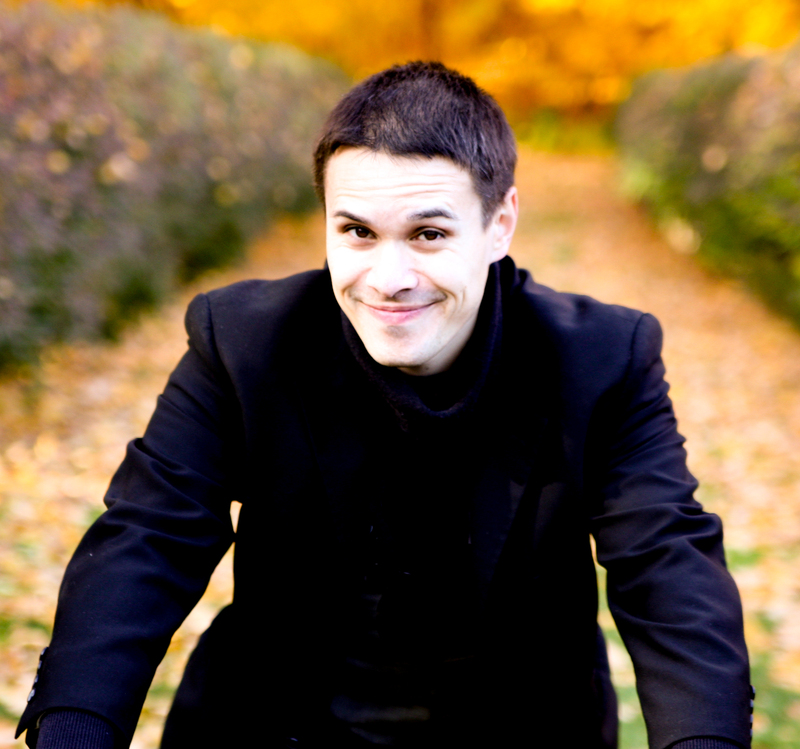 In terms of pure feel-good vibes, Jeremy Morse gives an eccentrically electric performance as Ogie, especially in the uproariously funny “Never Ever Getting Rid of Me”. 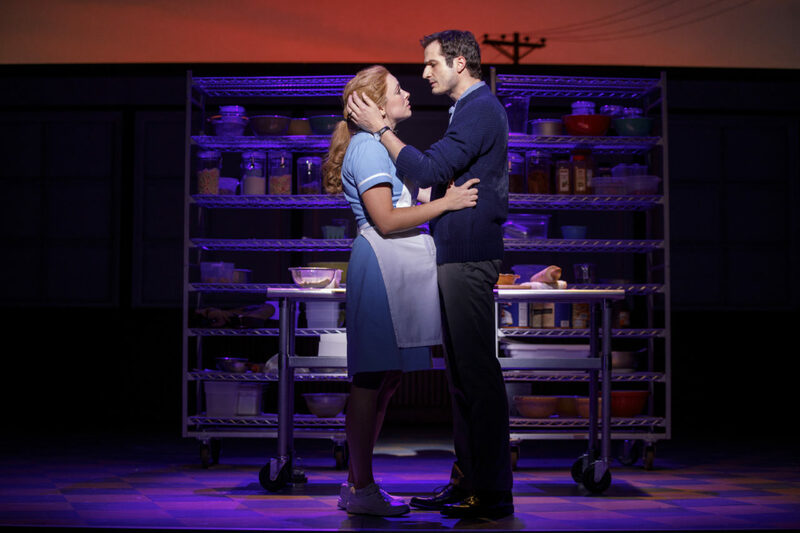 Waitress: The Musical plays through November 26 at the Orpheum Theatre in Minneapolis, MN.